Methionine adenosyltransferase (MAT) I/III deficiency (OMIM 250850) are an inherited metabolic disorder exhibiting persistent hypermethioninemia caused by the MAT1A gene mutations [1,2]. Clinical manifestations are variable and the diagnosis is completely based upon newborn mass screening. Hence, adult-onset patients could be underdiagnosed. Currently, definitive diagnosis is possible by MAT1A gene analyses. The aim of the present review article on MAT I/III deficiency is to describe correlation between the type of mutation and clinical presentation, and to demonstrate the importance of early DNA testing and commencement of therapy to prevent neurological manifestations. There are three forms of MAT in mammals; MAT I, MAT II, and MAT III. MAT1A encode single alpha1 subunit of both MAT I and MAT III (tetrameric and dimeric forms, respectively). MAT1A is expressed solely in mature liver cells, spans 3217 nucleotides, and encodes a protein of 395 amino acid residues . MAT II consists of highly homologous two moieties encoded by MAT2A and is expressed in all tissues . MAT activity is comprised of two steps; the first reaction transfers the adenosyl moiety to methionine, and the second reaction cleaves the tripolyphosphate. Figure 1 shows the metabolic cycle of methionine and homocysteine [1,5,6]. SAM (also famous as AdoMet) acts as the methyl donor for transmethylation reactions and has a central role in cellular metabolism. In patients with MAT I/III deficiency, reduced activity of the enzyme causes persistent hypermethioninemia and depletion of SAM. Figure 1: Metabolism of the Sulfur-Containing Amino Acids. 1, methionine adenosyltransferase (MAT); 2, methyltetrahydrofolate-homocysteine methyltransferase; 3, betaine-homocysteine methyltransferase; 4, cystathionine β-synthase. 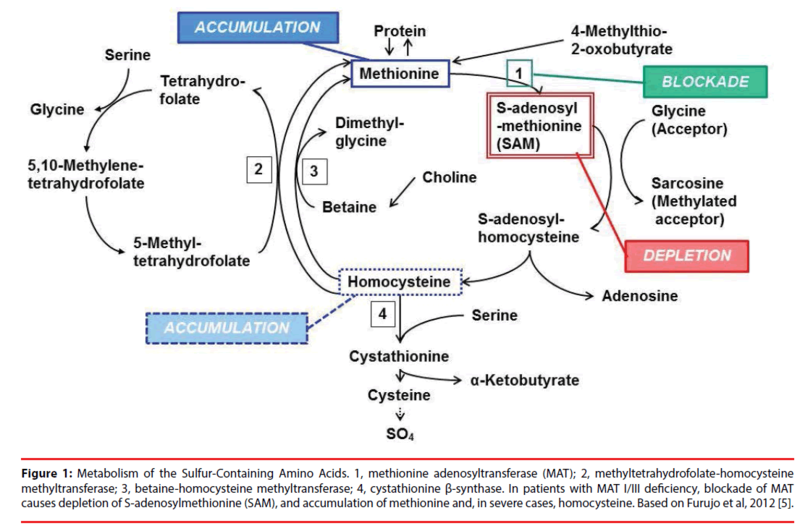 In patients with MAT I/III deficiency, blockade of MAT causes depletion of S-adenosylmethionine (SAM), and accumulation of methionine and, in severe cases, homocysteine. Based on Furujo et al, 2012 . Neurological manifestations of MAT I/III deficiency are quite variable among individuals [1,4,5,7-18]. The disease was considered as benign until neurological abnormalities and demyelination of the brain attributed by deficiency of SAM in cerebrospinal fluid were found . In severe cases, patients present with various neurological symptoms like headache, nystagmus, dysdiadochokinesis, and increased deep tendon reflexes. The disease also causes white matter lesions, as observed by magnetic resonance imaging (MRI). The consensus recommendations for the management of methylation disorders emphasize that MAT I/III deficiency is no longer a benign genetic disorder since considerable patients with MAT1A mutations develop neurological symptoms, ex. intellectual disabilities and movement disorders, later in life [19,20]. Investigation of disorders of methylation, at least by analysis of plasma amino acids, is recommended in patients with unexplained neurological signs and symptoms . A distinct odor of the breath (boiled cabbage odor) is another cardinal feature of MAT I/III deficiency; this is due to dimethyl sulfide, the alternative metabolism of methionine . Hyperhomocysteinemia is known to associate with hyperlipidemia and subsequent vascular disorders . However, only three pedigrees with MAT I/III deficiency are reported to be complicated with severe thromboembolic events leading to death . Extreme elevation of methionine in plasma without obvious increase of homocysteine or SAM, detected by usual newborn mass screening in the microplate methods or the tandem mass spectrometry, is suggestive of MAT I/III deficiency . Further analyses of methionine and other amino acids are performed by chromatographic methods. Careful exclusion of other possible causes of hypermethioninemia is necessary. Other genetic conditions causing hypermethioninemia are homocystinuria due to cystathionine β-synthase (CBS) deficiency, S-adenosylhomocysteine hydrolase deficiency, glycine N-methyltransferase deficiency, citrin deficiency, and fumarylacetoacetate hydrolase deficiency . A feature that distinguishes MAT I/III deficiency from above disorders is that SAM is not elevated, while methionine is persistently high. Elevation of plasma total homocysteine level in severe cases can confuse the diagnostic process, misleading to homocystinuria due to CBS deficiency [10,17,24]. Mitochondrial disorders can also be genetic causes of hypermethioninemia . Non-genetic conditions causing hypermethioninemia include prematurity, liver disease, and excessive ingestion of methionine . For several decades after deficient activity of MAT was first proved in 1974 in the liver of hypermethioninemic individual , liver biopsy was the major diagnostic method. Establishment of the amino acid sequence of MAT I/III [3,27,28] and mutations in MAT1A gene in patients with low hepatic MAT activity [2,5,8,9] has enabled definitive diagnosis without invasive procedure of liver biopsy. ▪ To treat or not to treat? No treatment is generally recommended to asymptomatic patients with MAT I/III deficiency. Couce et al. report five patients with MAT I/III deficiency that showed normal developmental quotients in spite of a moderate hypermethioninemia (< 150 μmol/L) . A boy with compound heterozygous mutations: c.191T>A (p.Met64Lys) and c.589delC (p.Pro197LeufsX26), showed elevation of plasma methionine and total homocysteine, and urinary homocystine. By starting methionine restriction diet at 31 days of age and maintaining plasma methionine levels less than 750 μmol/L, the patient, currently 5 years old, has entirely normal physical and psychomotor development and shows normal myelination in brain MRI . No specific treatment other than controlling plasma methionine level is generally recommended to asymptomatic patients with a mild or moderate MAT I/III deficiency. However, severe MAT I/III deficiency patients show neurological problems due to SAM depletion [1,4,7,10-13,30] (Table 1). Improvement in development and myelination after administration of SAM has been demonstrated without any adverse event [12,16]. Table 1: Mutations in the MAT1A gene in patients with MAT I/III-deficiency exhibiting central nervous system symptom. The pathogenic mechanism of SAM depletion has not been well understood. SAM is an important precursor to three biological pathways: methylation, polyamine synthesis, and trans-sulfuration. It acts as a methyl donor in biosynthesis of neurotransmitters such as dopamine, serotonin, and norepinephrine . Chamberlin et al. speculated that choline and myelin protein synthesis may be decreased by low SAM levels . Glutathione is produced through the trans-sulfuration pathway and used as a major antioxidant in cellular process. Polyamines (ex. spermidine and spermine), which have physiological effects of analgesia and anti-inflammation, are synthesized from methionine. Therefore, treatment with SAM could improve various metabolic processes in CNS. In rats, SAM administration induced synthesis of norepinephrine and serotonin and methylation of neuronal cell membrane phospholipids resulting in improvement of the neuroreceptor signal conduction . In humans, increase of 5-hydroxyindole acetic acid, a serotonin metabolism intermediate, is also induced. Side effects such as headache, restlessness, insomnia, and diarrhea have been reported . In patients with major depressive disorder refractory to antidepressant, usefulness of adjunctive treatment with SAM is reported in both depressive mood and cognitive symptoms [33-35]. Questions remain about the bioavailability and absorption of oral intake, especially its effects on transsulfuration pathway. In healthy adult subjects (age range, 22-44 years), after oral SAM administration (400 mg), plasma concentration of SAM increased from 38.0 +/- 13.4 to 361.8 +/- 66.4 nmol/L (mean +/- S.E.) and its halflife was 1.7 +/- 0.3 h. S-adenosylhomocysteine and 5-methyltetrahydrofolate significantly increased (from 29.9 +/- 3.7 to 51.7 +/- 7.1 nmol/L, and from 25.1 +/- 2.5 to 36.2 +/- 3.5 nmol/L, respectively), whereas homocysteine and methionine were stable during the observation up to 24 h . In another doubleblind, placebo-controlled, randomized study of healthy adult subjects (age range, 18-60 years), oral administration of SAM (800 mg/day) for 4 weeks did not significantly affect the level of plasma homocysteine . The same finding was obtained in clinical study in patients with major depressive disorder . Methionine restriction can be another therapeutic strategy when considering neurotoxic effect by hypermethioninemia. The guideline describes a benefit of methionine restriction in patients with MAT I/III deficiency with plasma methionine concentrations higher than 800 μmol/L . However, our patient showed neurological and radiological improvement under persistence of hypermethioninemia . Relative poverty of methionine may cause decreased metabolism of it and lead to depletion of SAM. Administration of high-dose pyridoxine can induce the methionine metabolism through the trans-sulfuration pathway and produce SAM . However, it was not effective in our patient , or caused deterioration in cases misdiagnosed as CBS deficiency, administered alone or when co-administered with betaine [4,11,40]. Definitive diagnosis of MAT I/III deficiency is possible by analyses of the MAT1A gene. Genotype–phenotype correlation is useful to identify patients with neurological problems as early as possible and to investigate the mechanism of clinical variation [4,15,19,22,28,40-42]. Mutations in the MAT1A gene can be analyzed by single strand conformation polymorphism analysis and direct sequencing of the genomic DNA of patients . The most common mutation, heterozygous for the autosomal dominant Arg264His mutation, is a relatively benign phenotype which requires no treatment; only one case has been reported to have myelination abnormalities by brain MRI . The Portuguese Newborn Screening Laboratory screened 5 hundreds of thousands of newborns by tandem mass spectrometry, found 21 patients with hypermethioninemia (cutoff level >50 μmol/L), and confirmed 20 patients with genetically-proven MAT I/III deficiency. Therefore an incidence for this condition was reported as 1/26,000 (the other one patient was CBS deficiency). Twelve newborns of the 20 MAT I/III deficient were fully investigated. All patients showed moderately increased concentration of plasma methionine and homocysteine, had R264H heterozygous mutation, and were in normal development. Brain MRI in one patient showed myelination abnormalities . Another study based on the Spanish regional newborn screening programs which evaluated 18 MAT I/III patients (incidence 1/22,874, methionine cutoff level 48-56 μmol/L) revealed that 15 patients (83%) were heterozygous for the autosomal dominant p.Arg264His mutation and, with one exception, presented relatively low circulating methionine concentrations (<400 μM). During continued follow-up (average, 3 years 7 months), the patients have been asymptomatic . Similar tendency was found in Japanese study which found 24 MAT I/III patients and 14 of them (58%) were heterozygous for an Arg264His mutation, although the incidence of this study is lower than the values reported in other countries, 1/107,850, probably because of a higher methionine cutoff level (80 μmol/L) . Chamberlin et al. reported that individuals carrying one wild-type allele and one Arg264His allele retain 30% of normal MAT activity in the liver, and therefore, those patients were relatively free of major clinical difficulties . In contrast, care must be taken on the MAT1A mutation other than Arg264His, because of the possibility of pathological reduction of MAT activity (Table 1). Fernández-Irigoyen et al. performed in vitro functional analyses of recombinant proteins that determine the enzyme activities of MAT1A variants, and found that the Arg292Cys and Arg356Pro variants showed impairment of MAT activity whereas the Gly69Ser and Tyr92His variants had almost normal enzyme activities . Compound heterozygosity in vivo can produce various phenotypic effects. The Tyr92His/Arg356Pro genotype was associated with the clinical presentation of decreased appetite and sleepiness by misdiagnosis and treatment of CBS deficiency . Myelination disorder was reported when Arg292Cys mutation was paired with Arg356Leu or with Glu145Lys [10,11,40]. The positions of some of the substituted amino acids in protein structure might explain the alterations of enzyme activity [45-47]. Mutations at Arg356 (Arg356Pro, Arg356Leu, and Arg356Gln) showed great influence in Japanese patients, and substitutions at this residue can be clinically informative for molecular diagnosis . At least 4 patients with homozygotes for MAT1A mutation leading to truncated subunits have been identified. They presumably have complete absence of MAT I/III activity (2 patients with 539insTG (185X) [7,8], 1 with 1043delTG (350X) , and 1 with 827insG (351X) ). Two patients with 185X are clinically normal, whereas the other two developed demyelination of the brain . It is puzzling that patients with null MAT1A gene mutation, which totally abolish MAT activity, could achieve normal brain myelination without any neurological symptoms, or diagnosed as having abnormal myelination only at age 11 years [7,8]. MAT II, synthesized in non-hepatic tissues and also in the liver though in low amounts, could sustain the metabolism in these patients. Hazelwood et al. reported that a 43-year-old man with normal brain myelination on MRI and normal neurological function, despite being homozygous for a 539insTG, had 7% residual hepatic MAT activity, which may reflect the hepatic activity of MAT II . Other mutations of the MAT1A gene in MAT I/ III-deficient patients are known to associate with abnormalities in central nervous system. There is a report of a boy homozygous for aberrant splicing mutation . Uniparental disotomy of chromosome 10 can cause homozygous form . MAT I/III deficiency is usually detected by newborn mass screening, characterized by hypermethioninemia. Over four decades since the first case report of deficient activity of MAT, wide range of clinical manifestation and gene mutations has been demonstrated. However, probably because of a diversity of neurological symptoms and complexity of evaluating related metabolites, its diagnostic process is not always straightforward, and actually there are several patients who experienced deterioration by unfortunate misdiagnosis. As for therapeutic strategies, case reports have shown that supplementary treatment of SAM can improve neurological and myelination deficiency. Methionine restriction can be an additional therapeutic strategy because hypermethioninemia alone may be neurotoxic; however, lowering methionine carries a risk to decrease the synthesis of SAM. DNA testing is important for early diagnosis to prevent or improve neurological manifestations. This study was supported in part by a Research Grant from the National Hospital Organization, Japan. Barić I. Inherited disorders in the conversion of methionine to homocysteine. J. Inherit. Metab. Dis 32(1), 459-471 (2009). Ubagai T, Lei KJ, Huang S, et al. Molecular mechanisms of an inborn error of methionine pathway. Methionine adenosyltransferase deficiency. J. Clin. Invest 96(4), 1943-1947 (1995). Alvarez L, Corrales F, Martín-Duce A, et al. Characterization of a full-length cDNA encoding human liver S-adenosylmethionine synthetase: tissue-specific gene expression and mRNA levels in hepatopathies. Biochem. J 293(Pt 2), 481-486 (1993). Chamberlin ME, Ubagai T, Mudd SH, et al. Methionine adenosyltransferase I/III deficiency: novel mutations and clinical variations. Am. J. Hum. Genet 66(2), 347-355 (2000). Andria G, Fowler B, Sebastio G. Methionine S-adenosyltransferase deficiency: Inborn Metabolic Diseases: Diagnosis and Treatment: Springer, Heidelberg, Germany (2006). Furujo M, Kinoshita M, Nagao M, et al. Methionine adenosyltransferase I/III deficiency: neurological manifestations and relevance of S-adenosylmethionine. Mol. Genet. Metab 107(3), 253-256 (2012). Chamberlin ME, Ubagai T, Mudd SH, et al. Demyelination of the brain is associated with methionine adenosyltransferase I/III deficiency. J. Clin. Invest 98(4), 1021-1027 (1996). Hazelwood S, Bernardini I, Shotelersuk V, et al. Normal brain myelination in a patient homozygous for a mutation that encodes a severely truncated methionine adenosyltransferase I/III. Am. J. Med. Genet 75(4), 395-400 (1998). Mudd SH. Hypermethioninemias of genetic and non-genetic origin: A review. Am. J. Med. Genet. 157(3), 3-32 (2011). Tada H, Takanashi J, Barkovich AJ, et al. Reversible white matter lesion in methionine adenosyltransferase I/III deficiency. AJNR. Am. J. Neuroradiol 25(10), 1843-1845 (2004). Ito M, Kotani Y, Matsuda J, et al. A methionine adenosyltransferase (MAT) deficiency patient treated with diet therapy. J. Inherit. Metab. Dis 26(suppl 2), 76 (2003). Furujo M, Kinoshita M, Nagao M, et al. S-adenosylmethionine treatment in methionine adenosyltransferase deficiency, a case report. Mol. Genet. Metab 105(3), 516-518 (2012). Faghfoury H, Shroff M, Blaser S, et al. Cerebral hypomyelination and maternal uniparental disomy 10 in a patient with MAT I/III deficiency. Mol. Genet. Metab 98(1), 21-22 (2009). Chamberlin ME, Ubagai T, Mudd SH, et al. Dominant inheritance of isolated hypermethioninemia is associated with a mutation in the human methionine adenosyltransferase 1A gene. Am. J. Hum. Genet 60(3), 540-546 (1997). Nagao M, Oyanagi K. Genetic analysis of isolated persistent hypermethioninemia with dominant inheritance. Acta. Paediatr. Jpn 39(5), 601-606 (1997). Surtees R, Leonard J, Austin S. Association of demyelination with deficiency of cerebrospinal-fluid S-adenosylmethionine in inborn errors of methyl-transfer pathway. Lancet 338(8782-8783), 1550-1554 (1991). Stabler SP, Steegborn C, Wahl MC, et al. Elevated plasma total homocysteine in severe methionine adenosyltransferase I/III deficiency. Metabolism 51(8), 981-988 (2002). Kim SZ, Santamaria E, Jeong TE, et al. Methionine adenosyltransferase I/III deficiency: two Korean compound heterozygous siblings with a novel mutation. J. Inherit. Metab. Dis 25(8), 661-671 (2002). Barić I, Staufner C, Augoustides-Savvopoulou P, et al. Consensus recommendations for the diagnosis, treatment and follow-up of inherited methylation disorders. J. Inherit. Metab. Dis 40(1), 5-20 (2017). Chien YH, Abdenur JE, Baronio F, et al. Mudd's disease (MAT I/III deficiency): a survey of data for MAT1A homozygotes and compound heterozygotes. Orphanet. J. Rare. Dis 10(1), 99 (2015). Obeid R, Herrmann W. Homocysteine and lipids: S-adenosyl methionine as a key intermediate. FEBS. Lett 583(8), 1215-1225 (2009). Martins E, Marcão A, Bandeira A, et al. Methionine adenosyltransferase I/III deficiency in Portugal: high frequency of a dominantly inherited form in a small area of douro high lands. JIMD. Rep 6(1), 107-112 (2012). Couce ML, Bóveda MD, Castiñeiras DE, et al. Hypermethioninaemia due to methionine adenosyltransferase I/III (MAT I/III) deficiency: diagnosis in an expanded neonatal screening programme. J. Inherit. Metab. Dis 31(2), 233-239 (2008). Lagler F, Muntau AC, Beblo S, et al. Hypermethioninemia and hyperhomocysteinemia in methionine adenosyltransferase I/III deficiency. J. Inherit. Metab. Dis 23(1), 68 (2000). Mudd SH, Wagner C, Luka Z, et al. Two patients with hepatic mtDNA depletion syndromes and marked elevations of S-adenosylmethionine and methionine. Mol. Genet. Metab 105(2), 228-236 (2012). Gaull GE, Tallan HH. Methionine adenosyltransferase deficiency: new enzymatic defect associated with hypermethioninemia. Science 186(4158), 59-60 (1974). Horikawa S, Ishikawa M, Ozasa H, et al. Isolation of a cDNA encoding the rat liver S-adenosylmethionine synthetase. Eur. J. Biochem 184(3), 497-501 (1989). Sakata SF, Shelly LL, Ruppert S, et al. Cloning and expression of murine S-adenosylmethionine synthetase. J. Biol. Chem 268(19), 13978-13986 (1993). Hirabayashi K, Shiohara M, Yamada K, et al. Neurologically normal development of a patient with severe methionine adenosyltransferase I/III deficiency after continuing dietary methionine restriction. Gene 530(1), 104-108 (2013). Mudd SH, Levy HL, Tangerman A, et al. Isolated persistent hypermethioninemia. Am. J. Hum. Genet 57(4), 882-892 (1995). Bottiglieri T. S-Adenosyl-L-methionine (SAMe): from the bench to the bedside – molecular basis of a pleiotrophic molecule. Am. J. Clin. Nutr 76(suppl), 1151S-1157S (2002). Mischoulon D, Fava M. Role of S-adenosyl-L-methionine in the treatment of depression: a review of the evidence. Am. J. Clin. Nutr 76(suppl), 1158S-1161S (2002). Papakostas GI, Mischoulon D, Shyu I, et al. S-adenosyl methionine (SAMe) augmentation of serotonin reuptake inhibitors for antidepressant nonresponders with major depressive disorder: a double-blind, randomized clinical trial. Am. J. Psychiatry 167(8), 942-948 (2010). Levkovitz Y, Alpert JE, Brintz CE, et al. Effects of S-adenosylmethionine augmentation of serotonin-reuptake inhibitor antidepressants on cognitive symptoms of major depressive disorder. Eur. Psychiatry 27(7), 518-521 (2012). Levkovitz Y, Alpert JE, Brintz CE, et al. Effects of S-adenosylmethionine augmentation of serotonin-reuptake inhibitor antidepressants on cognitive symptoms of major depressive disorder. J. Affect. Disord 136(3), 1174-1178 (2012). Loehrer FM, Schwab R, Angst CP, et al. Influence of oral S-adenosylmethionine on plasma 5-methyltetrahydrofolate, S-adenosylhomocysteine, homocysteine and methionine in healthy humans. J. Pharmacol. Exp. Ther 282(2), 845-850 (1997). Thompson MA, Bauer BA, Loehrer LL, et al. Dietary supplement S-adenosyl-L-methionine (AdoMet) effects on plasma homocysteine levels in healthy human subjects: a double-blind, placebo-controlled, randomized clinical trial. J. Altern. Complement. Med 15(5), 523-529 (2009). Mischoulon D, Alpert JE, Arning E, et al. Bioavailability of S-adenosyl methionine and impact on response in a randomized, double-blind, placebo-controlled trial in major depressive disorder. J. Clin. Psychiatry 73(6), 843-848 (2012). Nguyen TT, Hayakawa T, Tsuge H. Effect of vitamin B6 deficiency on the synthesis and accumulation of S-adenosylhomocysteine and S-adenosylmethionine in rat tissues. J. Nutr. Sci. Vitaminol. (Tokyo) 47(3), 188-194 (2001). Nagao M, Tanaka T, Furujo M. Spectrum of mutations associated with methionine adenosyltransferase I/III deficiency among individuals identified during newborn screening in Japan. Mol. Genet. Metab 110(4), 460-464 (2013). Chien YH, Chiang SC, Huang A, et al. Spectrum of hypermethioninemia in neonatal screening. Early. Hum. Dev 81(6), 529-533 (2005). Couce ML, Bóveda MD, García-Jimémez C, et al. Clinical and metabolic findings in patients with methionine adenosyltransferase I/III deficiency detected by newborn screening. Mol. Genet. Metab 110(3), 218-221 (2013). Fernández-Irigoyen J, Santamaría E, Chien YH, et al. Enzymatic activity of methionine adenosyltransferase variants identified in patients with persistent hypermethioninemia. Mol. Genet. Metab 101(1-2), 172-177 (2010). Markham GD, Pajares MA. Structure-function relationships in methionine adenosyltransferases. Cell. Mol. Life. Sci 66(4), 636-648 (2009). Muriello MJ, Viall S, Bottiglieri T, et al. Confirmation that MAT1A p.Ala259Val mutation causes autosomal dominant hypermethioninemia. Mol. Genet. Metab. Rep 13(1), 9-12 (2017). Kim YM, Kim JH, Choi JH, et al. Determination of autosomal dominant or recessive methionine adenosyltransferase I/III deficiencies based on clinical and molecular studies. Mol. Med 22(1), 147-155 (2016).